Fairbairn’s Hermeneutical Manual — Hermeneutical Manual or, Introduction to the Exegetical Study of the Scriptures of the New Testament, by Patrick Fairbairn (Philadelphia: Smith, English & Co, 1859). Also here. Fairbairn’s Hermeneutical Manual at archive.org. Biblical Hermeneutics by Milton S. Terry (1885). Also here. Biblical Hermeneutics: or, the Art of Scripture Interpretation. From the German of George Frederic Seiler ... with notes, strictures, and supplements from the dutch of J. Heringa ... translated from the originals with additional notes and observations by the Rev. William Wright ... (London: Frederick Westley and A.H. Davis, 1835). God-Centered Biblical Interpretation by Vern S. Poythress (1999). Complete book online. Intellectually sophisticated, seminary-level introduction to interpretation. Emphasizes the role of theology. Interpretation of the Scriptures by Arthur W. Pink. Complete book online. Word Alive: A Course on Bible Interpretation. A good series of lessons from the elders of Valley Bible Church in Lancaster, California. Also in pdf format here. The Organon of Scripture: or, the Inductive Method of Biblical Interpretation. By James S. Lamar. Complete book online, written by a Church of Christ scholar in 1860. Hermeneutics: A Guide to Basic Bible Interpretation. By Darryl M. Erkel (1999). Also here. Basics of Bible Interpretation. By Robert Smith. A book-length introduction. Also here. The Meaning of Scripture. By J. C. Wenger. How to Study Your Bible. By Siegbert W. Becker. Becker outlines some general principles and practical suggestions for students of the Bible. Hermeneutics: A Text-Book. By David R. Dungan (1888). Book-length introduction by a Church of Christ scholar. On Christian Doctrine by St. Augustine is a classic treatise on hermeneutics. Books 2 and 3 discuss techniques of interpretation. Biblical Hermeneutics. By George O. Lillegard. A compilation and summary of principles of biblical interpretation based on the works of Prof. W.M.H. Paterson, Dr. L. Fuerbringer, and Dr. C.G. Hofmann. This is an excellent presentation of sound principles of interpretation. Concise, but with many examples and references. Old Testament Exegesis. By Dr. Allen P. Ross at Beeson Divinity School. A series of long and interesting lectures at the seminary level. Includes lessons on the study of words, poetics, textual criticism, syntax, biblical theology, and practical exegetical exposition in the different genres of the Hebrew Bible. Some knowledge of Hebrew is required to fully understand the lessons, but students without Hebrew can follow most of it. LOCAL Biblical Interpretation. Several articles and resources with an emphasis on traditional Protestant approaches to interpretation. Resources for New Testament Exegesis. By Dr. Roy Ciampa at Gordon-Conwell Theological Seminary. A number of useful resources are here for advanced students, including a book, Reference Manual for New Testament Interpretation, compiled from materials prepared by various professors who have taught New Testament exegesis at Gordon-Conwell. Help to the reading of the Bible, by Benjamin E. Nicholls (London: Rivington, 1838). LOCAL Typology: The Symbolism of Scripture. A collection of articles. The Typology of Scripture By Patrick Fairbairn — 1st ed., 2 vols in 1 (Philadelphia, 1852); 2nd ed., 2 volumes in 1 (1854); 3rd edition, vol. 1 and vol 2 (1859); 6th edition, vol. 2 (Edinburgh: T & T Clark, 1882). Typology: A Summary of the Present Evangelical Discussion. By W. Edward Glenny. An article from the Journal of the Evangelical Theological Society 40 (1997). The Typical Significance of the Scriptures Declare Their Divine Authorship. By Arthur W. Pink. This is chapter six of Pink's book, The Divine Inspiration of the Bible. An Attempt to Establish an Historically Accurate Definition of Typology. By Scott David Foutz, Quodlibet online journal, May 1996. A detailed historical review and analysis of typological interpretation of the Bible. A Study of Biblical Typology. By Wayne Jackson, in the Christian Courier, November 3, 1999. Old Testament Types. By Rev K D Macleod, in The Free Presbyterian Magazine, September 1999. Also here. Shadows of Good Things, Or the Gospel in Type. By Russell R. Byrum (1922). A book-length study by a Church of God scholar. The Allegorical Sense of Scripture. By Mark P. Shea. An excerpt from chapter 7 of his book, Making Senses Out of Scripture. Using Isaiah 7:14 - "a virgin shall conceive" - Shea briefly explains how the meaning of Scripture can and often does go beyond the literal and historical sense. New Testament Use of the Old Testament. By Dan G. McCartney at Westminster Theological Seminary. This is chapter 6 from Inerrancy and Hermeneutic: A Tradition, A Challenge, A Debate, ed. H. Conn (1988). Points out the obvious error of hermeneutical textbooks that recommend grammatico-historical exegesis alone, to the exclusion of the New Testament's own typological method. (McCartney is co-author of a very helpful introduction to biblical interpretation: Let the Reader Understand: A Guide to Interpreting and Applying the Bible). How the Bible Has Been Interpreted in Christian Tradition. By Justo L. González. An article from the New Interpreter's Bible (Nashville: Abingdon, 1994). Also here. Get the notes here. A Summary of Augustine's Hermeneutic. By Daniel Knauss at Marquette University. "Augustine's approach to the interpretation of scripture in De doctrina christiana is indebted to classical rhetorical theory, a body of thought that was itself fundamentally concerned with hermeneutics." Biblical Interpretation in Augustine. By Dr. Thomas Williams of the University of Iowa. An article from The Cambridge Companion to Augustine. (Cambridge University Press, 2001). St. Augustine as an Exegete. By David S. Schaff, from volme 6 of Nicene and Post-Nicene Fathers. Farrar on the History of Interpretation — Frederic William Farrar, History of Interpretation: Eight Lectures Preached Before the University of Oxford in the Year MDCCCLXXXV (London: MacMillan and Co., 1886). Gilbert on the History of Interpretation — George H. Gilbert, Interpretation of the Bible; a Short History (New York: MacMillan, 1908). LacusCurtius. A comprehensive educational site on Roman history and culture, maintained by Bill Thayer at the University of Chicago. Includes writings of many Roman authors. The Ancient Library. A large collection of primary and secondary texts, edited by Tim Spalding. A Dictionary of Greek and Roman Biography and Mythology, edited by William Smith (1867), at the University of Michigan in page images: vol. 1 (A-D); vol. 2 (E-N); vol. 3 (O-Z). A Dictionary of Greek and Roman Antiquities, edited by William Smith: 2nd edition (1870) in page images at the University of Michigan; selected articles transcribed by Bill Thayer; and the third edition (1890-1) in two volumes at Google Books: vol. 1 (A-K), vol. 2 (L-Z). English edition of Seyffert’s ‘Dictionary of Classical Antiquities’ — A Dictionary of Classical Antiquities, Mythology, Religion, Literature & Art, from the German of Dr. Oskar Seyffert, revised and edited, with additions, by Henry Nettleship and J.E. Sandys. 6th edition (London: Swan Sonnenschein and Co., 1901). Greek Popular Religion. By Martin P. Nilsson (1940). Complete book online. The Private Life of the Romans. By Harold Whetstone Johnston (1903). An interesting little book, helpful for background information about the cultural context of the early Church. The Oriental Religions in Roman Paganism by Franz Cumont (1911). Mansel on Gnosticism — The Gnostic Heresies of the First and Second Centuries, By the Late Henry Longueville Mansel, D.D., edited by J. B. Lightfoot (London: John Murray, 1875). The Law of Hammurabi and Moses: A Sketch. Translated from the German of Hubert Grimme, together with a translation from the Babylonian of the Laws Discussed, and chapters on the history and archaeology of the Hammurabi and Mosaic Codes, by the Rev. W.T. Pilter (London: Sciety for Promoting Christian Knowledge, 1907). The Conflict of Religions in the Early Roman Empire, by T.R. Glover (London: Methuen,1909). Religion and Conscience in Ancient Egypt, by W. M. Petrie (London: Methuen, 1898). The Orient in Bible Times, by Elihu Grant (Philadelphia: J.B.Lippincott, 1920). The Literary Study Of The Bible: An Account of the Leading Forms of Literature Represented in the Sacred Writings, by Richard G. Moulton (London: Isbister, 1896). Lowth’s classic treatise on Hebrew Poetry — Lectures on the Sacred Poetry of the Hebrews by Robert Lowth , D.D. Lord Biship of London, Translated from the original latin by George Gregory, F.A.S. ; A New Edition with Notes by Calvin E. Stowe, A.M. (Andover: Crocker and Brewster, 1829). Herder’s ‘Spirit of Hebrew Poetry’ — The Spirit of Hebrew Poetry, by J. G. Herder, translated from the German by James Marsh. 2 vols. (Burlington: Edward Smith, 1833); vol.1; vol. 2. Also at archive.org: vol. 1; vol. 2. The Spirit of the Hebrew Poetry. By Isaac Taylor (1861). The Poetry of the Old Testament, by Theodore H. Robinson (London, 1947). The Hermeneutics of Biblical Lyric Poetry. By Daniel J. Estes. A conservative scholarly article from Bibliotheca Sacra (1995). Hengstenberg's Christology of the Old Testament — Ernst Wilhelm Hengstenberg, Christology of the Old Testament: And a Commentary on the Messianic Predictions, trans. by Theodore Meyer and James Martin. 3 vols. (edinburgh, 1854-8); vol. 1; vol. 2; vol. 3. Principles of New Testament Quotation, Established and Applied to Biblical Science, by James Scott (T. & T. Clark, 1875). Die alttestamentlichen Citate im Neuen Testament, von Eduard Böhl (Wien, 1878). As It Is Written: Studying Paul's Use of Scripture, edited by Stanley E. Porter and Christopher D. Stanley (Atlanta: SBL, 2008). Fairbairn on the Interpretation of Prophecy — Patrick Fairbairn, Prophecy Viewed in Respect to its Distinctive Nature, Its Special Function, and Proper Interpretation. 2nd ed. (Edinburgh: T & T Clark, 1865). The Shadow of Christ in the Law of Moses by Vern S. Poythress. Science and Hermeneutics by Vern S. Poythress. Redeeming Science: A God-Centered Approach by Vern S. Poythress (Crossway Books, 2006). The Use of Genre in Bible Interpretation. By Richard W. Engle, Professor of Old Testament at Baptist Bible Seminary in Clarks Summit, Pennsylvania. From The Journal of Ministry & Theology 4/1 (Spring 2000). A brief introduction to form criticism that seeks "to encourage the reader to apply the steps of genre analysis as part of his procedure in the study of the Holy Scriptures." Realistic or Historical Narrative? The Question of Historicity in the context of Literary Approaches to Biblical Interpretation. By Rodney J. Decker, Professor of New Testament at Baptist Bible Seminary in Clarks Summit, Pennsylvania. From The Journal of Ministry & Theology 4/1 (Spring 2000). Articles on hermeneutics and biblical criticism. Here are a number of recent journal articles by various scholars (mostly evangelical), provided online by Robert I. Bradshaw. Inerrancy and New Testament Exegesis. By R.T. France. A conservative scholarly article from Themelios 1 (1975). The Biblical Theology Library. A number of good scholarly articles on theological interpretation, made available on the Biblical Theology Briefings site by Dave Bish and other British students. Authors include well-known evangelical scholars such as Carl Henry, Darrell Bock, Craig Blomberg, Donald Carson, and others. The Superiority of Pre-Critical Exegesis. By David C. Steinmetz at Duke University. Article from Theology Today 37/1 (April 1980) that defends the patristic and medieval idea that "the meaning of Scripture in the mind of the prophet who first uttered it is only one of its possible meanings and may not, in certain circumstances, even be its primary or most important meaning." Reading Scripture. By Dr. Robert S. Rayburn, pastor of Faith Presbyterian Church (PCA) in Tacoma, Washington. An interesting seven-part sermon series in which the author presents the idea that "fundamental to the right understanding and the powerful preaching of God's Word" is "the fact that biblical truth is universally presented in dialectical form ... the Bible characteristically presents any doctrine in terms of its polarities. The truth concerning any particular subject or theme is taught, now in one place, now in another, in terms of the poles that lie at the opposite ends of the particular continuum." The Chicago Statement on Biblical Hermeneutics. A statement of principles endorsed by many conservative leaders at a meeting in Chicago, November 1982. How to Interpret the Bible. By Michael L. Gowens, pastor of Lexington Primitive Baptist Church in Lexington Kentucky. Some good practical advice in a brief essay. An Open Letter to Evangelicals and Other Interested Parties: The People of God, the Land of Israel, and the Impartiality of the Gospel. A public statement by the faculty of Knox Theological Seminary and other Calvinistic scholars who reject the idea that modern-day Israel should enjoy the unqualified support of Christians. This document is an excellent example of the way in which differing interpretations of prophesy can have important practical consequences. Hal Lindsey - How do we study the Bible? By Rev. W. Pouwelse. An article from Clarion magazine, April/June 1984. Criticizes the dispensational interpretation of prophecy popularized by Hal Lindsey (and more recently by the Left Behind novels) from a Reformed perspective. Hermeneutics and Biblical Theology. By Dr. Steven M. Baugh, associate professor of New Testament at Westminster Theological Seminary in California. Baugh briefly presents the case for christological interpretation of the Old Testament, with special reference to the biblical theology of Geerhardus Vos, in opposition to recent trends. Also here. Redrawing the Line between Hermeneutics and Application. By Brain A. Shealy, in The Master's Seminary Journal. The Relationship Between Exegesis and Expository Preaching. By Robert L. Thomas, in The Master's Seminary Journal. The Hermeneutics of Progressive Dispensationalism. By Robert L. Thomas, in The Master's Seminary Journal. An Essay On Liberal Hermeneutics. By Mike Stallard, Associate Professor of Systematic Theology at Baptist Bible Seminary in Clarkes Summit, Penn. Also here. Issues in Hermeneutics, by Herman C. Hanko, professor in the Protestant Reformed Seminary in Grandville, Michigan. A conservative Reformed treatment. Contemporary Theories of Biblical Interpretation. By Moisés Silva. An article from the New Interpreter's Bible (Nashville: Abingdon, 1994). Also here and here. Get the notes here. Canonical Criticism. By Gerald T. Sheppard. An article from the Anchor Bible Dictionary (New York: Doubleday, 1992) that discusses the post-critical hermeneutics of Brevard Childs. Also here. Hermeneutics and Epistemology: Hirsch's Author Centered Meaning, Radical Historicism, and Gadamer's Truth and Method. By Dwight Poggemiller. Article from the Global Journal of Classical Theology 1/1 (Sep. 1998). The Identification of the Early Christian Confessions. By Richard N. Longenecker. This chapter from Longenecker's recent book, New Wine into Fresh Wineskins: Contextualizing the Early Christian Confessions (Hendrickson, 1999), is a good example of how form criticism is used by New Testament scholars. Longenecker uses techniques of form criticism to identify traditional confessions of faith embedded in the New Testament. A Rich Variety of Literature as the Word of God. By Darvin H. Raddatz. A study of the Bible's different literary genres: Historical Narrative, Biography, Parable and Allegory, Proverb, Poetry, Prophecy, Epistles, and Apocalyptic. Conflicts in Interpretation. By Hans W. Frei. An essay, published post-humously in Theology Today, reflecting on contemporary hermeneutics. The Interpretation of Old Testament Prophecy. By J. Randolph Jaeggli, in the Detroit Baptist Seminary Journal 2 (Fall, 1997). The Use of Hermeneutics in Sermon Preparation. By Theodore Gullixson. A very long essay covering every imaginable aspect of hermeneutics. Discusses in detail the history, principles and applications of hermeneutics and especially how they affect sermon preparation, with several useful appendices. Hermeneutics. The subject index to the online scholarly essays at Wisconsin Lutheran Seminary. Biblical Discourse Analysis. Resources on the subject by Ralph Bruce Terry, Professor of Bible and Humanities at Ohio Valley College. Includes his doctoral dissertation, An Analysis of Certain Features of Discourse in the New Testament Book of 1 Corinthians. Rhetorical Criticism: History, Purpose, and Method. By Michael Morrison. Rhetorical Criticism of the Hebrew Bible. By Michael Morrison. Paronomasia and Kindred Phenomena in the New Testament, by Elbert Russell (University of Chicago, 1920). Modern Hermeneutics. By Ed Rickard. Some incisive comments on the weaknesses and bad tendencies in many modern textbooks on hermeneutics. Apostolic Hermeneutics and an Evangelical Doctrine of Scripture: Moving beyond a Modernist Impasse. By Peter Enns, Westminster Theological Seminary. An article from the Westminster Theological Journal (Fall 2003). Maintains that the NT authors understood and "engaged" the OT in ways that were merely "a function of their cultural moment" -- a surprisingly low view of Scripture for a professor at Westminster. I don't believe this is compatible with any meaningful doctrine of inerrancy. The Paul Page. A large collection of links to scholarly articles dealing with the "new perspective on Paul," maintained by Mark M. Mattison. Probably the best starting point for finding material on the subject, both pro and con. 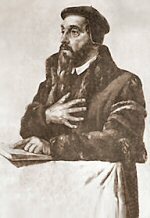 The Path of Understanding: The Development of Lectionaries and their use in the Lutheran Church. By the Rev. Alexander Ring in Tacoma, Washington (Evangelical Lutheran Synod). Gives a good short history of lectionaries and explores some hermeneutical implications of their use. Favors the 'Historic' lectionary and offers criticism of liberal tendencies in the Revised Common Lectionary. Also here. Lectionary Central. A ministry of the Austin Fellowship, a fraternity of conservative Anglican clergymen. Provides many good resources "for the study and use of the traditional Western lectionary." Lectionary Studies. By Bryan Findlayson. A complete resource site for teachers using the Revised Common Lectionary. Good material, and well organized. Seems to be mostly conservative. The Text This Week. By Jenee Woodard. Gives links to many resources for lessons on the current week's passages from the Revised Common Lectionary. The focus here seems to be on theologically liberal material. Lectionaries Old and New. By Kevin P. Edgecomb of Berkeley, California. Presents tables of the readings for many different historic and modern lectionaries. Biblical Exegesis. By A.J. Maas. A helpful article from the Catholic Encyclopedia (1909). Also here. Interpreting the Bible: Three Views. By Paul M. Blowers, Jon D. Levenson, and Robert L. Wilken. An article from First Things 45 (August/September 1994) in which the authors analyze the 1993 report of the Pontifical Biblical Commission. Catholicism and the Bible: An Interview with Albert Vanhoye. By Peter Williamson, First Things 74 (June/July 1997). Catholic writer Peter Williamson talks with Father Albert Vanhoye, Secretary of the Pontifical Biblical Commission, about key issues in Catholic interpretation of Scripture. LOCAL Jewish Interpretation of the Bible. By Michael Marlowe. A short introduction with examples and bibliography. How the Bible Has Been Interpreted in Jewish Tradition. By Michael A. Signer. An article from the New Interpreter's Bible (Nashville: Abingdon, 1994). Also here. Get the notes here. Jewish Biblical Interpretation in a Comparative Context. An Exhibition from the Center for Advanced Judaic Studies at the University of Pennsylvania, designed and edited by Seth Jerchower. Bible Exegesis. A 17-page article from the Jewish Encyclopedia, covering the history of Jewish interpretation up to the end of nineteenth century. English translation of Rashi's Commentary on the Hebrew Bible, reproduced from the The Judaica Press Complete Tanach with Rashi edited by Rabbi A.J. Rosenberg. Note: Users of the site need to click on the "show Rashi" link at the top right of each page to see the commentary. Evangelical Feminism and Biblical Truth: An Analysis of More than 100 Disputed Questions, by Wayne Grudem (Multnomah, 2004). A comprehensive treatment of "evangelical" feminist interpretations. The complete book (over 800 pages) can be downloaded in a PDF file at this site. Should We Move Beyond the New Testament to a Better Ethic? An Analysis of William J. Webb, Slaves, Women and Homosexuals: Exploring the Hermeneutics of Cultural Analysis, by Wayne Grudem. An article from the Journal of the Evangelical Theological Society 47/2 (June 2004) pp. 299-346. Grudem dismantles the "trajectory" hermeneutics favored by some feminists. Also here. Feminism, Homosexuality, and Hermeneutics: Exercises in Eisegesis. By Jefferis Kent Peterson. The Hermeneutics of Evangelical Feminism. By Paul W. Felix, in the Master's Seminary Journal 5, no. 2 (1994). Excerpts from Texts of Terror: Literary-Feminist Readings of Biblical Narratives by Phyllis Trible (Philadelphia: Fortress, 1984). Also here. Get the notes here. Feminist Biblical Interpretation. By Katharine Doob Sakenfeld, in Theology Today. A comparison of three representative methodologies of feminist interpretation. The Spirit of Biblical Feminism-An Analysis of Biblical Feminist Hermeneutics. By R.J. Koester. A study of the principles underlying the Biblical feminist movement of the mid-to-late 1970s. Gender Passages in the NT: Hermeneutical Fallacies Critiqued. By Andreas J. Köstenberger, Westminster Theological Journal 56 (1994).